MN shows solidarity with Syria and Venezuela | Fight Back! Minneapolis, MN - On Sept. 13. 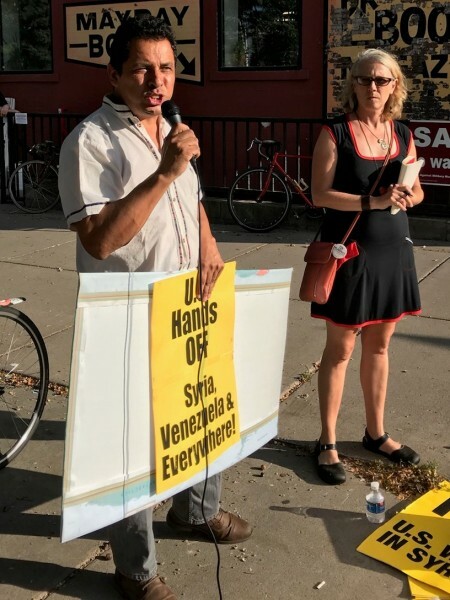 Minneapolis peace groups held a protest to “send an urgent anti-war message” in response to the Trump administration’s threats to conduct new airstrikes in Syria and to plots of a military coup in Venezuela. The protest featured two speakers who both focused on the real motivations for U.S. intervention and denounced the Trump administration’s excuses of democracy and starving people in Venezuela and a potential chemical weapons attack in Syria as excuses to justify an expanding U.S. presence in South America and the Middle East. The MN Peace Action Committee announced that it will hold an emergency response protest if the U.S. bombs Syria and/or attempts to overthrow the government of Venezuela.